Nearly all of the 91 original engagements of “Alien” were in the deluxe 70-millimeter wide gauge format, which amounted to a record number (at the time) of large format prints made available at a single distribution launch. Ashley Boone, Twentieth Century-Fox Senior Vice President for Domestic Marketing, described the initial release strategy as providing a “proper presentation”, offering moviegoers an “extraordinary” and “special event”. Fox had used a similar release pattern two years earlier with “Star Wars”, but for “Alien” the company amplified the scale of the initial launch, increasing the number of initial engagements and 70mm blow-up prints, and spending more money on promoting the movie. “So much for exhibitors who say the public doesn't care how a film is presented”, Boone told film industry trade publication Variety in May 1979 following the release of the film. “Our initial research shows that in cities where both 70mm and 35mm engagements were playing, customers went to the 70mm cinemas. They know the difference”. Considering the release strategy a success, Fox would use a similar approach — limiting initial engagements to key markets and emphasizing the presentation — in subsequent years with films such as “The Rose” (1979), “The Empire Strikes Back” (1980), “Quest For Fire” (1982), “Die Hard” (1988), and “Edward Scissorhands” (1990). This presentation-oriented release strategy — reminiscent of the reserved seat engagement “roadshows” that were popular in the 1950s and ’60s — was based on providing moviegoers with the most impactful experience. Several film critics made mention of the 70mm presentation in their reviews urging moviegoers to consider choosing the 70mm presentation in cities offering both 70mm and 35mm presentations. Presentation comments in the film reviews ranged from, “’Alien’ is in 70mm and Dolby, both of which go far in completing the spookiness” to “you're going to be most appreciative of the film in its most technically advantageous circumstances”. 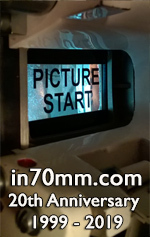 The “70mm-Dolby Stereo” format logo was prominently featured in promotional materials: trailers, TV spots, theatre marquees, posters, newspaper ads, etc. Fox was very high on supporting “Alien” with the high-quality and expensive 70mm format. (At the time, a 70mm print cost about eight times that of a conventional 35mm print.) Even the film’s test screenings shown several weeks before release (in Dallas and St. Louis) were presented in 70mm. The few 35mm prints that rounded out the launch were essentially used for extra engagements in high-population markets to help combat turnaway business. “Alien” grossed an impressive (for the time) $3.5 million in its opening weekend (the four-day Memorial Day weekend period), resulting in a phenomenal $38,709 per screen average. Influenced by the mostly good reviews and capacity-filled screenings, Fox expanded the release of the film two weeks later on 8 June (sooner than originally planned), and, by 22 June the film was playing on over 500 screens throughout the U.S. and Canada, the majority of which at this time were 35mm presentations. Fox's 70mm print order was 110 prints, more than 75 of which were put into circulation in the 25 May first wave release. Of the remaining 70mm prints, they were put into circulation during the expansion waves in markets just beginning an engagement (such as Montreal) or as additional engagements in markets included in the first wave (like St. Louis and Los Angeles), and later, in a number of international markets (including London and Sydney). After several months in release, “Alien” concluded its North American release with a cumulative box office gross of over $75 million, $40.3 of which was considered the "rental" and returned to the distributor. Not bad for an R-rated film and 1979 ticket prices. “Alien” spawned three follow-up films (a fourth is in production) and has had a successful after-life on home video and television. It was among the earliest films ever to be released as a “Special Edition” on the LaserDisc format, the type of treatment we now take for granted with DVDs. In autumn 2003 “Alien” was re-released as a “Director's Cut” (with some D-Cinema engagements), and is included in the nine-disc “Alien Quadrilogy” DVD set released in December 2003. “Alien” remains a sci-fi/horror classic, and it is doubtful those moviegoers who ventured into a cinema in 1979 have forgotten the experience. What follows is a list of the 91 original, 25 May 1979 "First Wave" engagements of “Alien” which illustrates the presentation and select-market distribution approach used for the film. For those of you who remember the original release, enjoy the flashback! Engagements have been identified, as best as could be determined, based on the specific community or city in which the cinemas were located. But because the selected-market distribution strategy in which “Alien” was initially released is the subject of this article, the market city or metropolitan area is identified in parenthesis for clarification. The cinema operators, including independents, have been identified in front of each cinema name. Those exhibitors commonly known under an acronym, such as UA (United Artists Theatre Corporation) or AMC (American Multi-Cinema), are listed as an acronym. Observing the list, readers can get a sense of what the major markets were in North America circa 1979. Those moviegoers who saw “Alien” in a theatre in 1979 may feel a touch of nostalgia looking over the engagement list, particularly if the cinema in which they recall attending a screening is represented. As well, moviegoers with an appreciation or fondness for classic or hometown cinemas may be saddened by the realization that most of the cinemas included in the engagement list are no longer in business, victims of what some in the exhibition industry would consider progress: the megaplex. “’Alien’ Alters Fresno Theater”, The Fresno Bee, 25 May 1979. “’Alien’ Grosses $3.5 Million In First Four Days”, The Hollywood Reporter, 30 May 1979. “Alien Starts May 25 in 70mm Dolby Stereo”. Dolby Laboratories, Inc. Advertisement, Variety, 16 May 1979. "Alien Quadrilogy". 20th Century Fox Home Entertainment DVD 2009847, 2003. Champlin, Charles. “The Horror Of 'Alien:' Scary-City Of Another Kind”, Los Angeles Times, 20 May 1979. “Dolby Stereo Equipped Theatres”. Dolby Laboratories, Inc. Selected issues between November 1978 - June 1980. Gerber, Eric. “Alien” film review, The Houston Post, 25 May 1979. Janusonis, Michael. “Alien Will Scare You Out Of Your Wits”, The Providence Journal, 25 May 1979. Pollack, Dale. “Alien Cracks Open 3-Day B.O. Egg For Smash $2.6 Mil Holiday Flight At 91 Houses”, Variety, 29 May 1979. Sackett, Susan. “The Hollywood Reporter Book Of Box Office Hits”, New York: Billboard, 1996. Schreger, Charles. “Accountants Put The Bite On 'Alien'”, Los Angeles Times, 27 April 1980. Schreger, Charles. “Hatching 'Alien': High Hopes At 20th-Century Fox”, Los Angeles Times, 28 May 1979. Schreger, Charles. “Invasion Of A Box-Office Smash”, Los Angeles Times, 30 May 1979. Sharp, John. “70mm Film Presentations in London, England 1958 – 1998”, The 70mm Newsletter, Issue 55, December 1998. “'The Alien' Rocketing Past 'Star Wars' In 91 Theatres”, The Hollywood Reporter, 29 May 1979. If you wish to provide feedback or contribute to this list, please contact Michael Coate or Thomas Hauerslev.